Dassault’s brand new Falcon 5X has entered the ground testing phase following power up of the first aircraft at the end of August. First flight is expected by the second quarter of next year and certification by the end of 2016. The fuselage for the first aircraft arrived at Dassault’s main assembly plant in Mérignac, near Bordeaux, in June and received its wings, new Snecma Silvercrest engines and onboard systems during the summer. The initial ground tests covered electrical and fuel system, hydraulics, and testing of the Falcon 5X’s advanced digital flight controls. All tests went as expected. Ground vibration testing will start later this month. “We are extremely pleased with the way the program is advancing, and are fully on schedule for a second quarter 2015 first flight,” said Olivier Villa, Senior Vice President, Civil aircraft, Dassault Aviation. Assembly teams are currently installing final onboard test equipment on aircraft number one in anticipation of an initial engine run-up by year end and the commencement of taxi tests shortly thereafter. Final fuselage outfitting of aircraft number two is set to begin in November and work on the subsequent units will follow at one aircraft per month. The development program for the new Silvercrest high-bypass engine is proceeding as planned, with eight power plants involved in the engine test and certification campaign. The engine has accumulated 1,300 hours on the bench to date. SNECMA commenced the engine flight test campaign in June using a dedicated flying test bed. “The engines have demonstrated nominal and max take-off thrust levels and shown very satisfactory operability and dynamic behavior,” said Olivier Villa. Meanwhile, Dassault engineers are proceeding with avionics and flight control testing on the integration test benches at Dassault Aviation flight test center in Istres and on the global simulation bench at Dassault Aviation headquarters in Saint-Cloud. This test bench replicates the Flight Control System and the Hydraulic System. Preparations are also underway for Falcon 5X airframe static and fatigue testing. The fatigue test article was delivered to DGA-Ta (former CEAT) in Toulouse, France earlier this month and testing is due to begin in January. In addition to the standard qualification tests, aircraft equipment will be subjected to a pair of efficient endurance testing methods – the Highly Accelerated Life Test (HALT) and Highly Accelerated Stress Screening (HASS). these additional tests are part of a comprehensive effort to ensure that the 5X is fully mature by delivery of the first aircraft. The testing will expose equipment and systems to extremes of vibration, humidity, temperature, pressure and other in-flight phenomena exceeding those that the aircraft will be subjected to in service. 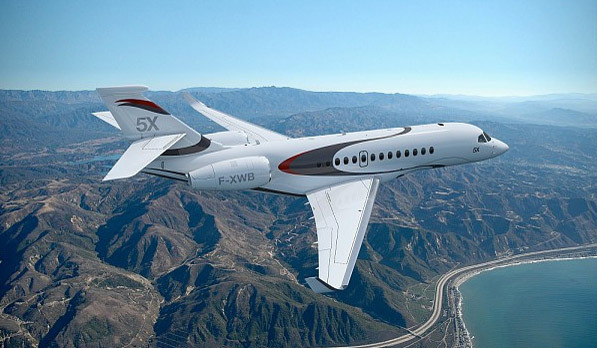 The Falcon 5X benefits from production improvements such as Product Lifecycle Management (PLM) software that permits the aircraft to be designed, built and supported using a single set of computer modeling data that is shared by Dassault and all suppliers and subcontractors involved in the project. The program uses the latest iteration of PLM, version 6, which extends PLM functionalities to the system level, streamlining and accelerating the design and testing process.